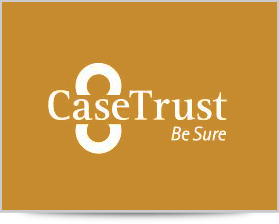 CaseTrust Gold is the premier tier of the CaseTrust Accreditation Scheme. Recipients of the CaseTrust Gold award are businesses with the added edge that distinguishes them as industry leaders. CaseTrust Gold recognises business excellence and superior customer service. To consumers, CaseTrust Gold represents a promise of the highest possible standards in service quality. The award recognises dynamism and innovation, the desire of businesses to keep pace with changing consumer demands & needs, inspiring the level of consumer confidence that is worthy of being talked about. INTERESTED TO BE THE PRESTIGIOUS CASETRUST ACCREDITED GOLD BUSINESS? Please contact CaseTrust at 6461 1800 or email casetrust@case.org.sg for the Info Kit.